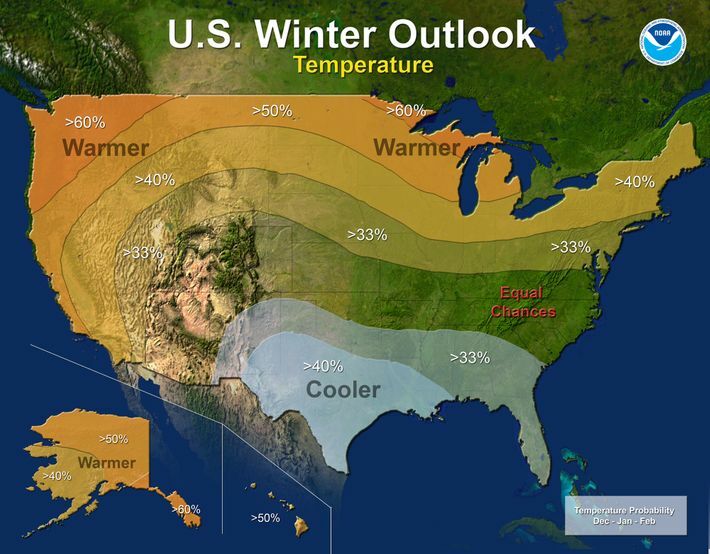 We’re deep in Pumpkin Spice Latte season, but winter will be here before you know it, and according to government forecasters, you should expect El Niño to be hanging around for most of it. On Thursday, scientists from the National Oceanic and Atmospheric Administration released its winter-weather outlook, which predicted that this year’s El Niño — a weather phenomenon that happens when equatorial waters in the Pacific Ocean heat up — could be one of the strongest on record. Whether it will reach “Godzilla” levels, as previously forecast, is yet to be seen, but it will definitely dump significant amounts of rain on California and the southern U.S., and likely bring warmer, drier weather to the North. While the rain might be welcome in parched California — though it probably won’t erase four years of drought — forecasters also say Texas, Florida, and even the East Coast should expect above-average precipitation. 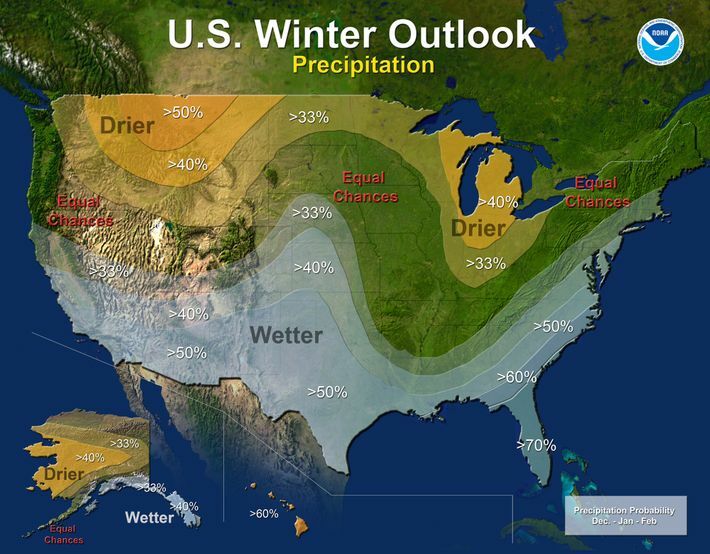 Whether that will be rain, snow, or one of those “wintry mixes,” scientists can’t say yet. The southeastern U.S. will probably be much cooler than average, while the Rockies, the Great Plains, and most of the northern United States will probably get the best deal, with drier, warmer weather. 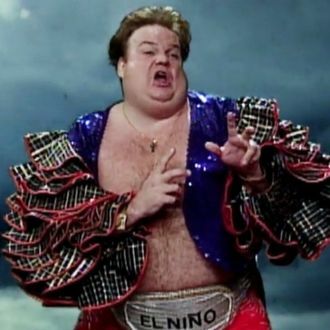 But before you bow down to the power of El Niño, a NOAA scientist did predict that in the Northeast, which suffered through the weather equivalent of the Dark Ages last year, will probably see “6 percent fewer heating days” than last winter, which, looking at the glass half full, probably translates to one less subway delay and a couple of bucks off the ConEd bill. But at least for the near term, the weather gods, ever fickle, have decided to dump some November weather on everyone toward the end of this week. A cold front is swinging down from Canada, which will probably keep temperatures in the New York area in the 50s this weekend, or possibly 40s outside the city. Sunday will probably be the coldest day, with some people waking up to 30-degree temperatures Sunday morning and the first frost of the season. Since sleeping until June is not an option, take solace in the fact that we should hit the 60s again next week.